Electric signals produced by Africa’s freshwater mormyrid fishes are useful to fish taxonomists seeking to discover and describe the many still undocumented species in this group. However knowledge how to record and make use of these signals has been limited to a few specialists in the U.S. and Europe until now. 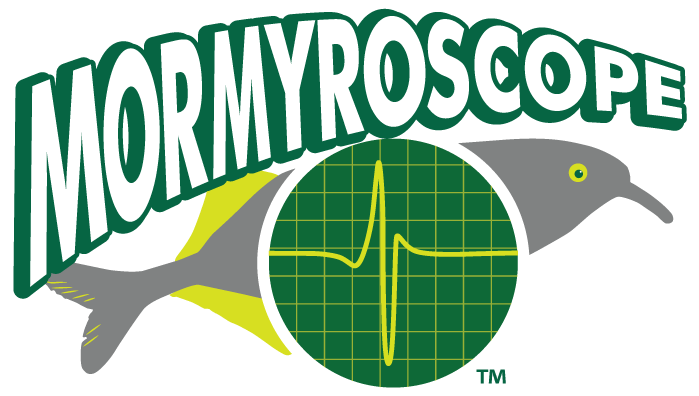 Mormyoscope is the first publicly available software application specifically designed for making digital recordings of electric fishes. Researchers at Cornell University have just published the description of a new species of weakly electric freshwater fish from Gabon, Africa in the Zoological Journal of the Linnean Society. They’ve named it Paramormyrops ntotom. Here I lay out how I record the electric organ discharges (EODs) of mormyrids and offer some advice on how you can do so yourself. This is written with mormyrids in mind, but most of this will also hold for recording EODs from gymnotiform fishes in Central & South America. What I know about EODs and recording them I've learned from Professor (now Emeritus) Carl Hopkins of Cornell University and from experience on more than one dozen field trips to Africa. I'll update this article as needed to keep it current and maximally helpful. Feel free to leave your comments or questions. In my previous article about how to put together a mormyrid "fish finder" from two inexpensive Radio Shack hobbyist amplifiers, I described using cheap speaker wire for the electrodes. I have just added to this site instructions for building the much nicer electrodes we have used in the Hopkins lab for many years, written by Garry Harned who designed and built them. There are two documents, on written in 2000, the other in 2007. In the second of my "how-to" blog articles, I'll cover how to build and use the famous "Hopkins fish trap." At least, it should be famous. This device is responsible for catching more live mormyrid specimens than any other, and it has worked for me every place I've visited in Africa. Locating and capturing weakly electric fishes (African mormyroids and South American gymnotiforms) in the field is made substantially easier by the use of a hand-held, battery operated amplifier attached to an electrode lowered or cast into the water. The amplifier converts the electric impulses of the fish into audio, allowing the user to determine the presence, proximity and approximate number of individuals within one to several meters from the electrode, depending on the size of the fish.